Beijing had always been a milestone for me and my journey and with the arrival of Gao back at the beginning of July it took on a whole new meaning. Well, now China’s capital has been and gone, and with it the end of an era. Gao and I pedalled in late last week after a mammoth 200km day, the 35th day on the road since leaving Urumqi on the other side of China. The indomitable Gao, Ya Guang aced it from start to finish. I pedalled out from Beijing on the 16th after a few days rest and sponsor activities with my Title Sponsor Accenture, alone this time, back to just Hercules and I – my big red flagged buddy with me no more. I shall miss his company and giggles, his friendship and insight – it has been a privilege, an education and a whole lot of laughs to pedal with him and I am super glad that he had the balls to bound up to me and announce his intentions all those miles ago. Here’s to Gao and all that his spirit and journey stands for. So, next time you’re dithering over whether to do something or not, just think back to Gao. Such courage and bravado to suddenly decide to do something as rash as say you’ll cycle 4,ooo km to Beijing!!!! Thank you Gao. Hope to meet you someday. I am sure Sarah will miss you as she travels on through China and into Russia. So, how’s he getting home? Cycling again? At least he might get a tail wind on the way back. Well done to both of you , I was having withdrawal symptoms without any news for a few days ha ha , I hope Sarah that you are enjoying China as much as I do , and you have found it to be an eyeopener and a country that Westeners do not understand until they visit , regards Sujuan and Robert . This is the beauty of adventure…the life unanticipated…! Dreams, Adventure, Stories…then again… Well done Sarah and Gao…! Congratulations Sarah! I have been following your trek since mid July. Your interview with Gao was special. We are all capable of doing things we thought we could never do. Your trek and adventure has challenged me in this way. Looking forward to more reports and updates. Stay safe! WoW meeting up with someone that can travel across to China with you ‘just like that’ was amazing – like Sliding Doors, we just don’t know what’s around the corner!!! 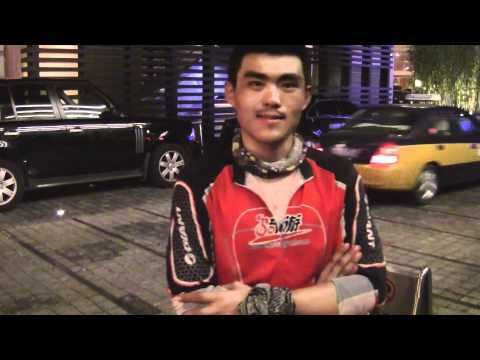 Hope we get to meet Gao – he has to be in London as you arrive back down the Thames 2013 ?? How he must be feeling after his achievement too !!? You don’t regret what you do, just what you don’t do when afforded an opportunity for an adventure! What an amazing thing he did and he seems like a very likeable guy. I have a vision of him, smiling as an old man in the future when he thinks back to that distant day, many years ago, when he impulsively took off on an adventure with a crazy English woman! It’s life stories such as this which will make your journey the incredible experience that we know it will be. Can’t wait to buy the book. Keep on pedalling, Sarah, I am sure you will miss your companion and thanks to him for his friendship and encouragement. We are out in Kimberley, BC, Canada and I will contact Tim Moss on our return to the UK re your bike journey from Vancouver. Much enthusiasm out here from a friend, Don Davis, who has done Vancouver to Kimberley by bike several times and also Kimberley to New York fairly recently. Much love from here and all at SJS, UK. Wonderful to be (nearly) able to share this experience with you. This has been a very uplifting event and I admire your courage and your belief in human goodness. Keep going Sarah. I love his attitude in this video. Amazing outlook to life. Wish both of you the best in your future endeavors. Hi,every one. I am back to my normal life and taking care my sick grandmother. thank you every one who cared this trip and thank you everyone who given us a best wish . Sarah , my friend and my partner. Thank you. I can’t finish this trip without you . You given me an Unforgettable trip. When we encounter the sand storm, Your optimism inspired me. when we went through the Huoyan mountain(flame mountain) You given me cooler by your water. I will find my future but not afraid , not fear loss. Because the song you sang :we are the champion my friend. Gao my friend – drop me an email buddy! I have tried calling but your phone is always off/not answered and I don’t have your email address. Hope you’ve been out on stranger lately. Gao… RESPECT! As we would say in Japan: otsukaresamadeshita!